There has been a lot of publicity about the arrival of a relatively new (to NZ that is) oil on the supermarket shelves. Rice bran oil is touted as a cold-filtered, vegetable oil that is high in plant sterols and Vitamin E and has the most balanced fatty acid composition imaginable. Is it really a wonder oil or is it just another refined oil dressed up to imitate natural cold pressed oils? Crude rice bran oil is dark in colour and high in free fatty acids.it is a waste product from rice polishing then is solvent extracted. The oil on the shelves in NZ is pale in colour and bland in flavour with low FFA. We got Massey University to analyse the oil from supermarket shelves. The tables below show their results. Comments are that it is a fully refined ,bleached and deodorised oil with really no unique characters. The claims for high levels of vitamin E and beta sitosterol are unjustified. An avid reader of this column wrote to the editor pointing out a supposed discrepancy in our last epistle. The reader pointed out that in one part of the article we cautioned against the use of excessive Omega-6, then reported the launch of Anchor Spreadable with high oleic sunflower oil. The reader erroneously assumed that this oil was high (65%) in linoleic acid (Omega-6) whereas it is called high oleic sunflower oil because it is a selected hybrid (crop bred not GMO) of sunflower which contains 80% oleic (monounsaturated) and small amounts of linoleic acid. It is similar in composition to olive oil. 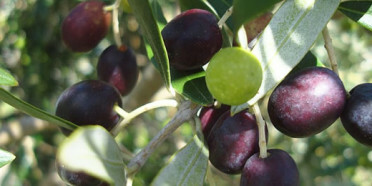 An article appeared recently reporting work done at the University of Pennsylvania on identifying an anti-inflammatory compound (oleocantral) in extra virgin olive oi. This compound inhibits the activity of cycloxygenase (COX) enzymes – like ibuprofen, celebrex etc. the researchers identified the behaviour of this compound by its astringent effect at the back of the throat. It would be interesting to see if NZ extra virgin oils are high in content. However can olive oil replace these active drugs? Their dose related experiments suggested that 500ml of EV olive oil was required to match one dose of ibuprofen – so not really a viable alternative to the drug – but still encouraging as to the natural health benefits of EV olive oil. One of our members, Dr Carlene McLean recently appeared in the Crop and Food Digest as a result of her research work on seaweed extracts which can act as antioxidants in preparations containing Omega-3 oils. Dr McLean’s work supports the hypothesis that oxidised oils are likely to impact on health. Oxidised oils could also account for the variable results of health research trials. NB. It is now well documented that oxidised cholesterol is far more atherogenic than unoxidised oil. Consumer Magazine recently reviewed yellow-fat spreads. The detailed article shows the content of saturated fats and trans fats and makes recommendations on which are the healthier spreads. All our thoughts are with one of our members, Anny Dentener, who recently lost her husband Peter through a sudden heart attack at the age of 50. Peter was well known in the scientific community and was obviously a much loved parent, friend and citizen judging by the crowded attendance at the church. I am sure all of NZIFST and the members of the oils and fats group will extend their sympathy to Anny and her family.